REACH provides the opportunity for national authorities to propose substances to be considered under REACH for authorisation (via adding to the Candidate List of Substances of Very High Concern, SVHC), restriction or (from 2011) evaluation. National authorities can also propose substances for harmonised classification and labelling, though usually only for carcinogenic, mutagenic and/or reproductive toxicity (CMR) and respiratory sensitisation properties unless there is strong justification for considering another endpoint(s). The UK REACH CA Steering Committee confirms the annual work programme of the UK REACH CA that is then delivered by the CA. One component of this programme is the progression of work on individual substances for introduction into EU REACH processes. In this context, the Steering Committees has developed a process and criteria by which nationally the UK can develop a list of priority substances on which the UK REACH CA will work. The flow chart below outlines this process. 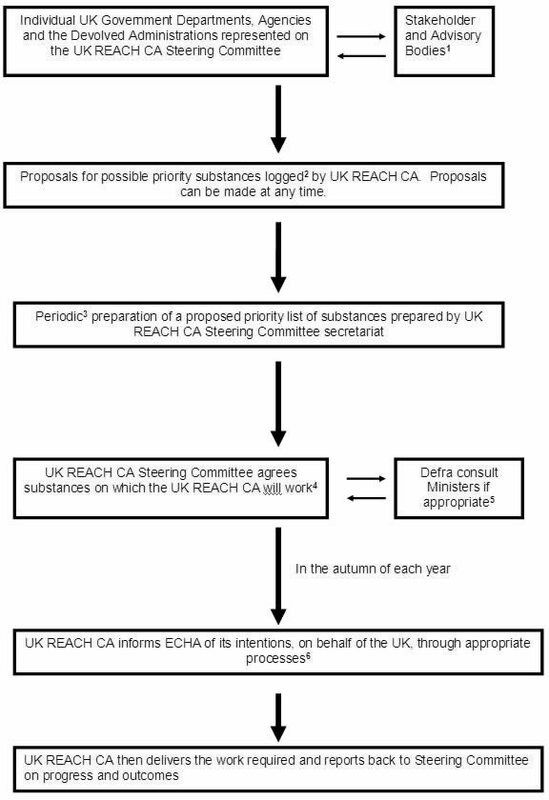 Proposals for possible priority substances logged2 by UK REACH CA. Proposals can be made at any time. Stakeholders should approach the relevant UK Government Department, Agency or Devolved Administration to put forward suggestions on possible substances for consideration. UK Government Departments, Agencies and the Devolved Administrations may also seek input from their relevant advisory bodies. The UK REACH Competent Authority Steering Committee secretariat will maintain a log of proposed substances. Each proposal will have an associated explanation of the basis/justification for its entry into the log, which will also carry information on the EU-wide picture. Preparation of a proposed priority list will be linked to REACH processes operating at EU level as well as taking account of the work planning cycles for the UK REACH CA. The Steering Committee will consider the proposed priority list will agree a final list for taking forward including a consideration of the resources available within the REACH CA to deliver the overall package. Ministerial consultation may be required in some circumstances where proposals for action need a higher level of approval. The REACH CA will use the mechanisms operated at EU level by ECHA to put forward formal proposals for activity by the UK.